Giacomo Puccini was suffering from throat cancer as he tried to complete his last masterpiece, Turandot, in 1924. The composition of a final duet between Calaf and Turandot remained pending when he died after surgery in Brussels. Puccini's colleague, Franco Alfano, completed the duet as well as a finale, using Puccini's notes and sketches. This full-length version is the one that has been performed worldwide ever since the opera premiered in 1926, two years after Puccini's death. In 2000, Italian composer Luciano Berio was commissioned by Casa Ricordi, the company owning the rights to Puccini's score, to elaborate a new composition and orchestration for Turandot's finale as an alternative to that of Alfano. Now, Chinese musician Hao Weiya will compose yet another - the third - version of the opera's ending. To celebrate the 150th anniversary of Puccini's birth, the newly-open China's National Center for the Performing Arts (NCPA, also known as National Grand Theater) and Ricordi have commissioned Hao to write the first "Chinese edition" of Turandot which will premiere at the NCPA on March 21 through 26. "Opera is universally considered the most complete and varied form of theater as it involves music, singing, acting and often dancing set in a scenic context," says Chen Zuohuang, music director of NCPA. "We want to produce one opera ourselves in the first season of the new theater. Puccini's Turandot tells the story of a Chinese princess and uses the tune of the Chinese folk song Jasmine. It is, naturally, a good choice for us. We would like to have a Chinese composer to create a real 'Chinese ending'," says Chen. "There have been hundreds of productions of Turandot since it premiered in 1926, but in most cases, Chinese history and culture have not been well represented. Our production will feature the Rome-based Chinese conductor Lu Jia, who is an expert both in Italian opera and Chinese culture. It will also have a Chinese director and a cast of Chinese singers." The project has received support from the Italy Foundation of Festival Puccini. When its president Manrico Nicolai and general manager Franco Moretti visited NCPA last September, they brought with them the first full-length score of Turandot published in 1926 as a gift to the NCPA. "We are honored that Puccini's last masterpiece will be performed at the new splendid National Center for Performing Arts. It is an opera telling a story about a Chinese princess written by an Italian musician. Now Chinese artists will revive the production with some Italian singers, which is a message that the two countries will have more cultural communication in future," says Nicolai. "2008 is important to China, because Beijing will host the Olympic Games. For Italy, 2008 marks the 150th anniversary of our great musician Puccini. His masterpiece Turandot is a bridge between the two countries," says Moretti. Composer Hao has created an 18-minute finale including an aria The First Tears for Princess Turandot. Calaf's aria Nessun dorma is one of the most famous opera arias, but Puccini did not write a very impressive aria for Turandot, even though she plays the title role of the opera. She actually does not sing until the second scene in Act II. "Turandot is often seen as a princess as beautiful as the sun but as cold as ice. Liu's death and Calaf's love break through the barrier that has shut her from all emotion. In the finale, Calaf tears Turandot's veil from her face and kisses her. The princess then bursts into tears. I have written the very emotional and sweet The First Tears for her to capture the nuances of this moment," says Hao. Chinese theater director Chen Xinyi will direct the NCPA version. Chen says the power of love and Calaf's heroism are the themes she will try to explore in the opera. "I did not understand why Turandot is so cold-blooded though I have watched several versions of the opera until I carefully studied the story this time to prepare to direct it," she says. "She (the princess) pledges to thwart any attempts of suitors because of an ancestor's abduction by a prince and subsequent death. She is not born cruel and is finally conquered by love. I will try to make Turandot more understandable and arouse the sympathy of Chinese audiences for her." To achieve this, Chen creates two new roles: The ghost of her abducted ancestor who makes Turandot determined to avenge the prince and a feather man who symbolizes love. 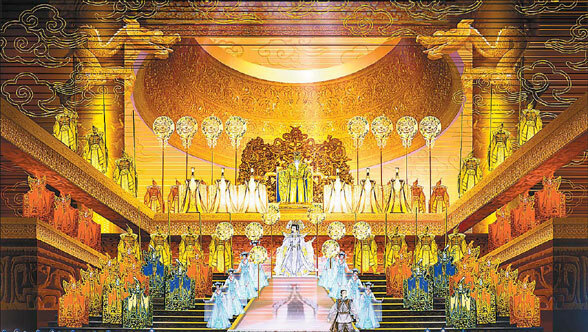 Gao Guangjian, NCPA's director of set design, will create a splendid "Forbidden City" for the opera. This is the fifth time Gao will be designing sets for the opera. In June 1997, he worked for the production at the Teatro Comunale in Florence, directed by Zhang Yimou. The next year, he re-worked Zhang's production when it moved to the real Forbidden City in Beijing. In 2003, he collaborated with Zhang again for an arena production of Turandot at the stadium of the 2002 World Cup in Seoul and this version toured France and Germany in 2005. In 2004, the National Peking Opera Theater of China invited him to design the sets for the Peking Opera version of Turandot. "Every version has its own unique needs. This time, I will take three main points into consideration. Firstly, the NCPA hopes to attract more people into theater, many of whom may be first-time opera-goers, so the setting must be very impressive. "Further, the NCPA has the most advanced stage equipment today and I will try to make full use of it. Finally, the production will tour abroad, so many details will feature Chinese elements, to emphasize that this is a Chinese Turandot," Gao says. While preparations are on full steam for the show in March, some concerns remain. Composer Hao says: "I have tried to make the 18-minute finale sound close to Puccini's music while also blending in Chinese musical elements." But achieving the right balance can be a challenge for a Chinese composer who lives in the 21st century and does not speak Italian, trying to complete an opera written nearly 100 years ago. Though a veteran director, with more than 80 theatrical productions under her belt, including a few operas, Chen Xinyi too has had to grapple with not being able to read the score, having little knowledge of Italian opera and not knowing to speak Italian.